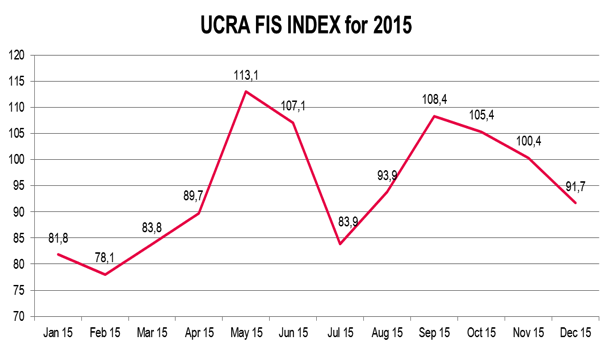 UCRA FIS INDEX (Foreign Investor Sentiment Index) for Ukraine in November dropped by 8.7 points to reach 91.7 points. 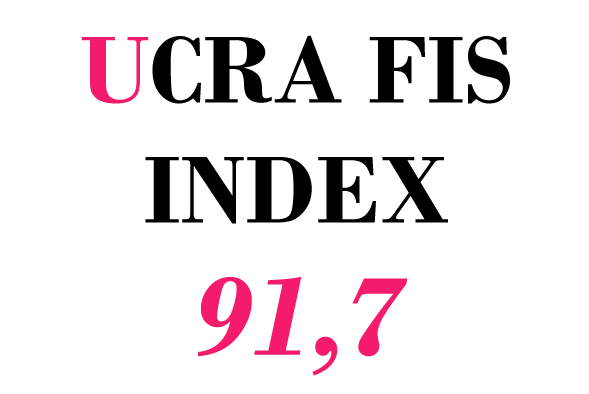 As we expected (see UCRA FIC INDEX release as of November 1), after three months of being in the positive zone (value of UCRA FIS INDEX was 108.4 as of September 1, 105.4 on October 1 and 100.4 on November 1), increasing negative dynamics of the index brought it all the way down to the negative zone. The uncertainty about the tax reform and parameters of the state budget for the next year contributed greatly to the sentiments of investors. At the sectoral side, as before, the prospects of investment in agriculture are the most optimistic among respondents (sub index value of 138.4) as throughout the year this sub index never visited the negative zone. Last month, the adoption in first reading of a law on deregulation in the agricultural sector served as one of the factors that positively influenced the perceptions of investors. 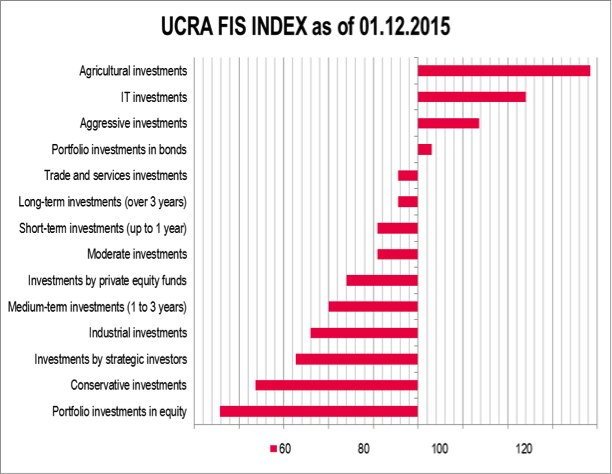 No negative background on IT market after the dramatic events of September and October (offices of a number of companies being searched by the tax authorities) immediately returned the relevant sub component of UCRA FIS INDEX to the positive zone – assessment of the prospects of investments in this sector increased from 66.7 to 124.0 points. The attractiveness of investments in the sector of trade and services remains close to the neutral level (95.5), while industrial investments, according to the respondents, have become much less promising (76.0). In terms of instruments, as well as earlier, investors prefer bonds (103.1) to equity investments (55.8). Overall low attractiveness of these instruments (equity, in particular – the whole year its sub index was constantly below 100) is dictated by the weak economic prospects of issuers as well as by the hard currency exchange restrictions on the market. The news on Soros investing in a new private equity fund in Ukraine managed by Dragon Capital has had its general positive effect on the market, yet it has not been fully reflected in the expectations of our respondents – they perceive the prospects for private equity funds as relatively weak (84.0), which is only slightly better than expectations for direct strategic investments (72.7). Prospects for long-term and short-term investments (95.5 and 90.9 respectively) are viewed slightly better than the short-term (80.0). Aggressive investment strategy (113.6), as has been the case throughout the year, takes over moderate (90.9) and conservative (63.6) approaches to financing projects in Ukraine.